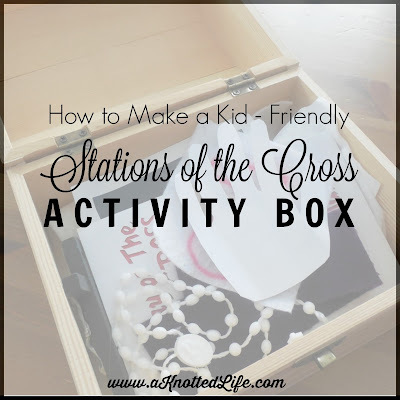 A few weeks ago I had some pictures of our Lenten decorations and included a shot of a little treasure box that holds our Stations of the Cross kit. I got a few emails and comments asking about it so I thought I'd share with you what we do and how it looks. I keep our Stations kit on top of our computer desk so the kids can't easily get at it and lose everything. The box itself is just a simple treasure chest type box we got for a couple of dollars at Hobby Lobby. Inside is a Stations of the Cross booklet for children that I found at our local Catholic goods store. There is also an object that represents each station. I announce the next station and say, "We adore You, O Lord, and we praise You," and the kids and I all say, "because by Your Holy Cross You have redeemed the world." After this I tell the kids what object they need to find in the box. #1 a piece of rope, like what tied Jesus' hands together when he was sentenced to death. #3 a piece of felt with the number one and a band-aid to symbolize Jesus falling for the first time. #4 a rosary for when He met His Mother. #5 a helping hand for when Simon helped Jesus carry His cross. The one pictured is L's traced on some cardstock from a few years ago. #6 a piece of felt that I sketched Jesus' face on for when He met Veronica. #7 a piece of felt with the number two and a band-aid for the second time Jesus fell. #8 a tissue for when He meets the weeping women. #9 a piece of felt with the number three and a band-aid for when He fell the third time. #11 a nail for when Christ is nailed to the cross. #12 a crucifix for when Christ dies. #13 an image of the Pieta for when Christ is brought down from the cross and placed in His mother's arms. As they hold and pass around the object we discuss what's happening. I point out the picture and briefly explain what's happening to Jesus. The booklet also talks about how what happened to Christ can help us to live better lives. For instance, just like Simon of Cyrene helped Jesus carry His cross we can help people in need. We then end each station with the simple prayer that's included in the booklet. Anyways, I highly recommend the booklet, which is why I included the publishing information in the image above. After seeing this all you're probably thinking, "Hey! We already do something like that!" and you probably do. The contents of the kit are what many people use for "Resurrection Eggs" but I prefer this way, which I learned from Kate Wicker. The reasons I like this more are: a) the carton would be smooshed in no time but the box is sturdier b) plastic eggs are one more thing for the kids to lose or break and me to keep track of c) putting everything back in the box, in no particular order, makes clean up much easier. d) the kids like digging around in the box. If it's not broke I'm not going to fix it. While we're well into Lent I don't think it's too late to make on of these kits. If nothing else you can use it during Holy Week and the Triduum. I must say, unlike the rosary, this is a prayer that I can do with the kids that doesn't leave me frustrated and angry. If you decide to do this I wish you happy gathering and praying! I know I was one of those comments. Thanks, Bonnie! This is so great, thanks so much for sharing! I think having all the items in the box means you probably don't need full illustrations in the booklet. I really like that idea. Might have to adopt that one myself. We go to the stations almost every Friday in Lent (well, this year has been the exception...) but it might be good to get this together for this year on Good Friday since we are traveling over EAster. Thanks for the post! Very informative. What an awesome idea! I love it. I just bought the Happy Saints Way of the across book and my kids are enthralled with it. I thinki will try making this to go along with it. I'm just in awe! This is so good! Bonnie I seriously love this! Linking to it! I love this!! 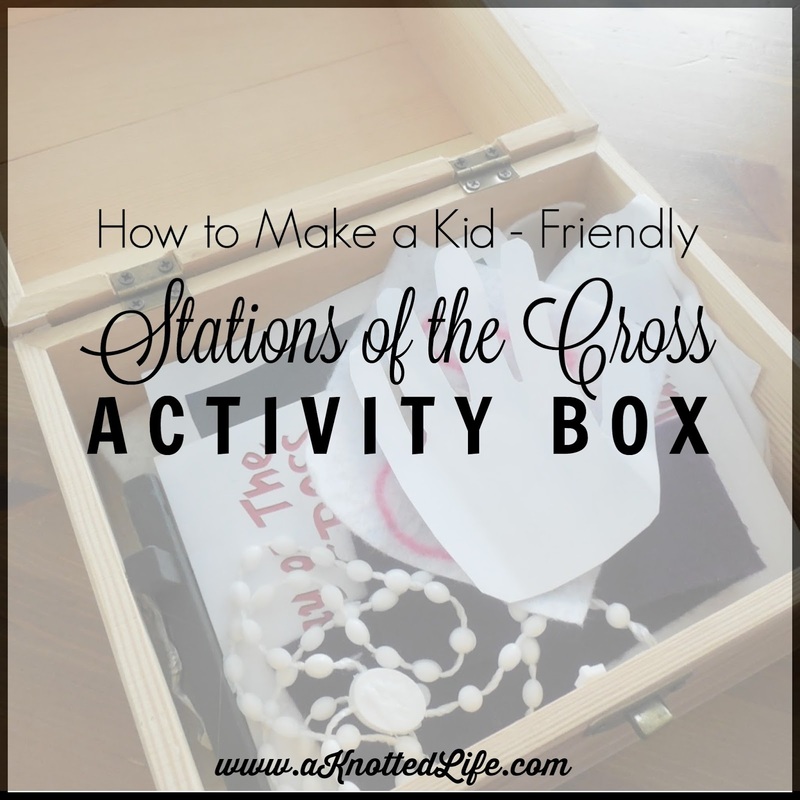 I am putting something like this together for my kids this year and I think putting it all in one box is a great idea!! Love this! Thanks for sharing all the details for easy replication. I've struggled to find a kid-friendly book, too. What a wonderful idea! I'm definitely going to try this with my kids this year.